The Brycer has come and gone and I have pulled materials for my next projects. 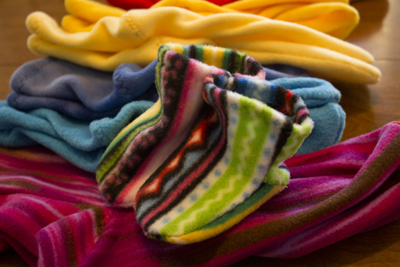 I have decided to first finish 72 pairs of fleece socks for this winter’s craft shows. I like to think of it as my “factory work”. When the kids were young and needed chauffeuring to different activities, I tied fishing leaders for a time. There would be dry spells with no work when I would fret and worry and then lay out on their poor ears a line they repeat to me to this day, "If I'm not here when you get home from school, I've gone to the factory!" I must add that they learned my Scarlet O'Hara drama well and the re-telling of this story along with creating their own dramas comes back to haunt me! I never did go off to the factory, except to do flu shot clinics when we would simply go to vaccinate the workers with their flu shots for the year. I did get a peek at factory line production however, and found something appealing in repetitive sort of work. Perhaps after being a nurse and a special educator, I thought it would be fun to assemble something and count how many I had done, for I was never sure if I could count on my students to really make it to grade level in their reading and there were days that I wasn’t sure that progress of any sort was being made. The same for my nursing days; despite great treatment plans I would inevitably end up reading about one of my patients in the obituaries. And parenting, suffice it to say doesn't always guarantee predictable results either. 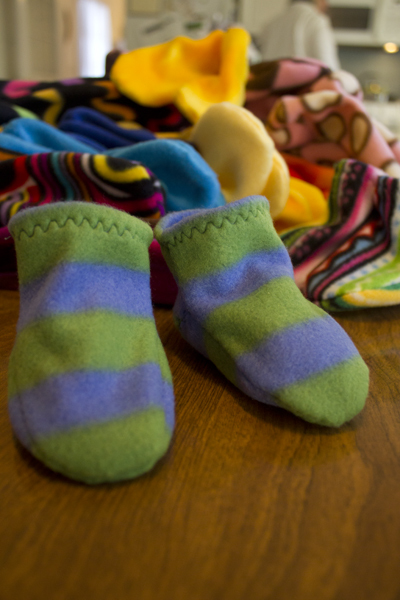 So in short, there is something quite satisfying about making fleece socks. They are bright and colorful, fun to cut out and touch their softness, bright colors and prints and still more fun to stitch them up and count them when I am done! At last, satisfying factory work right in my own home. Stitching socks is but an interim job however. It is a "warm up" exercise for what is to come next, as I sketch out variations of a new project and design patterns that I can hardly wait to try out!